A recent project saw the Pro Coatings team called in to help in the renovation of Patshull Hall, a property in Wolverhampton. In this project, Pro Coatings Solutions were given the brief of respraying the spindles of a spiral staircase in the property. 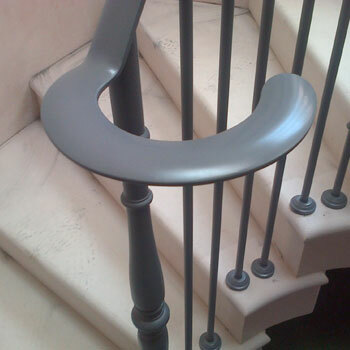 The client wanted us to spray the spindles in a dark silver finish to match the existing aesthetic of his home. The house was undergoing renovation at the time of respraying, so we were required to work a strict time schedule of one day. Due to the fact that the property was undergoing a complete renovation, our teams of painters had to be very careful with the spraying process: they had to make sure that overspray did not occur and damage any other fixtures in the house. To minimise the risk of this happening, we masked the area off, protecting any other areas from paint damage. After we had masked off the area, we degreased the mild steel staircase spindles and applied some primer to add the respraying process. When this was dry we applied a top of dark silver paint, as per the client’s request. We managed to carry out the work to an impeccable standard, within the given time frame. The customer was very happy with the standard of the finished respraying.